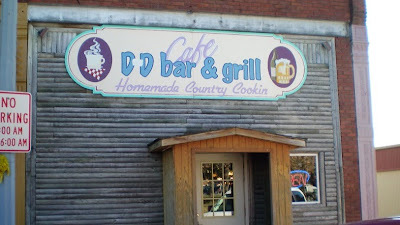 The D & D Bar & Grill was recommended in Iowa: An Explorer's Guide , which can be found here. 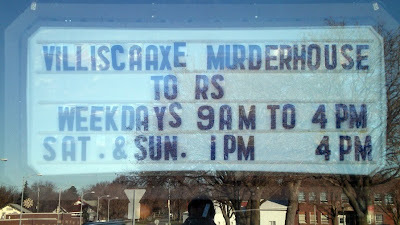 The sign reading Homemade Country Cooking greeted me before I walked in the door. Its display of a coffee cup on one side and a beer on another reflects the dual nature of most small town pub and grubs, which have to serve everything a small town populace needs in order to get enough business to stick around. Location: 307 East 4th Street in Villisca, in Montgomery County in Southwest Iowa. 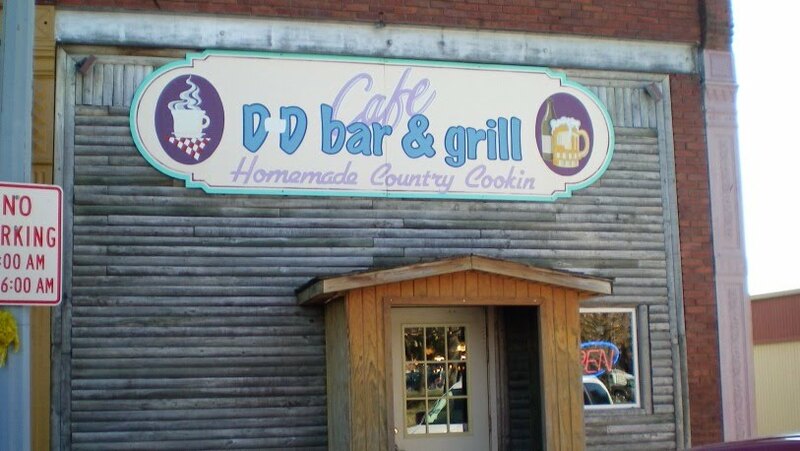 Directions: You take Highway 71 south from 34 to get to Villisca, and the D & D Bar and Grill is on the south side of the main square. 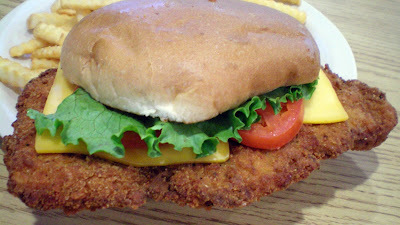 The Tenderloin: What this tenderloin gets right is the crunchy breading and juicy darker meat. 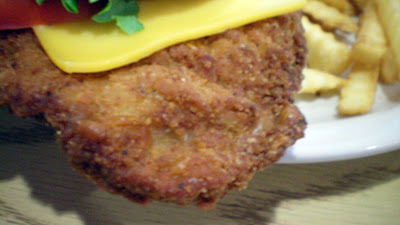 You can see in the close-up the breading is made from cracker meal. The tenderloins here all seem to have the same curved bowl shape. Served on a big untoasted bun with pickles by the side. Overall 8.372 out of ten. Price: $4.25 a la carte. Also on the menu: A big menu with most of the hometown cafe basics of burgers and salads. There is a fish fry buffet on special occasions I need to check out. Service: It seemed like one woman was taking everyone's orders and cooking all by herself when I was in. Ambiance: Locals pack this hometown cafe that seems to be in a time warp with wood panels and old furniture. The interior is a mishmash of checkerboard ceiling tiles and mirrors. There are tables and a bar for seating. The kitchen is in the middle of everything. Cozy Cafe occupies the corner of a strip mall in Clive that resembles every other strip mall in the Western Suburbs. A couple Des Moines restaurant veterans turned this location into a comfort food option for people driving along Hickman Road west of Des Moines, and it has a Grounds For Celebration franchise inside serving a full menu of coffee drinks. 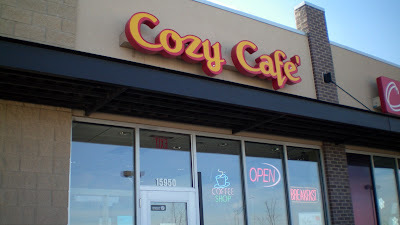 Special Note: Cozy Cafe opened in February 2010 in a western section of Clive. It is not to be confused with the Corner Cafe, another suburban retro diner serving comfort food in nearby Urbandale since April 2010, staffed by former employees serving a menu from the closed Urbandale Cafe. That place is down the street from the original Des Moines retro diner, Stella's Blue Sky, now open on 100th st. Cozy Cafe is owned by the folks who operated The Rock Restaurant, and previously ran Pat's Corner Cafe on Ingersoll, and some other place before that. Location: 15950 Hickman Rd. in the Dallas County side of Clive. Directions: Its next to Wendy's on Hickman Rd/Highway 6 on the way to Waukee and Adel. The Tenderloin: This thing is a great size and value, and heavy to pick up. 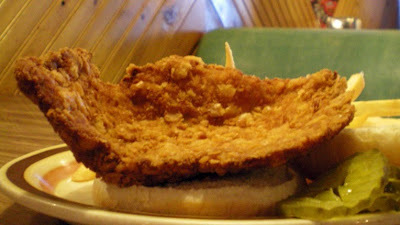 The meat is in the classic pork loin butterfly cut that ends up in a sort of triangular shape. The uneven thickness of the meat made some parts much thicker than others. The overall juiciness retention of the meat was exceptional. 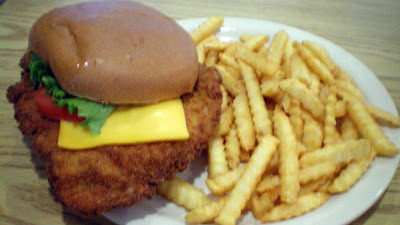 There was just enough seasonings to add some taste to the breading. The two slices of American cheese were an extra 35 cents. Served with fixins on a large soft toasted bun. Overall 7.943 out of ten. 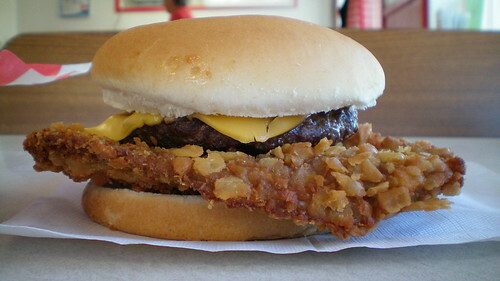 Price: $5.95, on special with a drink on Thursdays. Also on the menu: The house specialty is the cavatelli, dating from when the owners served Helen and Pat's Cavatelli, and there is the usual diner fare of coneys and burgers. There are also homemade dessserts, daily soups and a full breakfast served until eleven. The coffee counter and drive-thru have a full selection of espresso drinks. Sides are served a la carte. Ambiance: The strip mall is less than five years old, and this place has a small dining are with booths for seating. There is new colorful tile and natural light on the decorations. 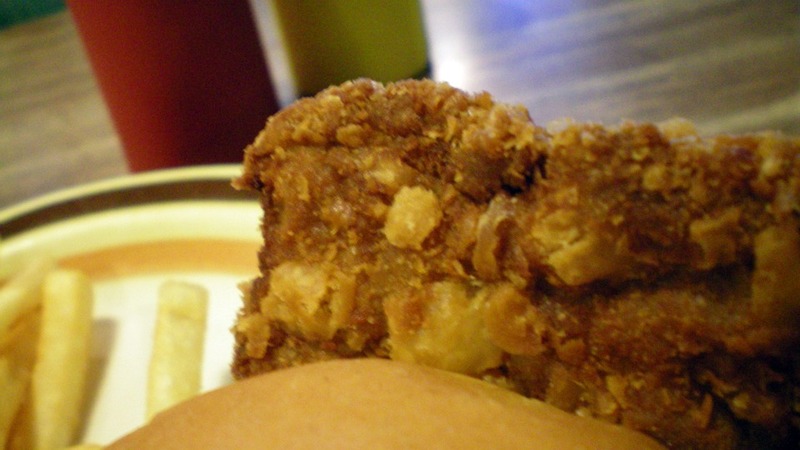 Final Thoughts: The Cozy Cafe is serving up classic Iowa comfort food for people who don't even know Hickman as the road to Adel. 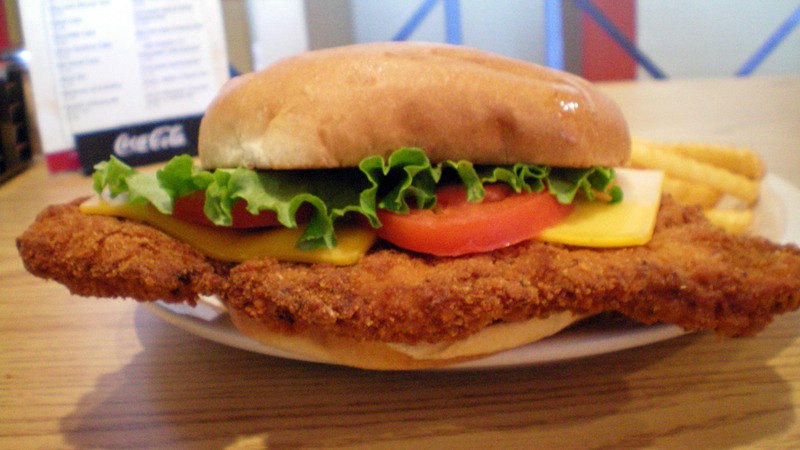 Additionally, you can now get a tenderloin and chase it with a Red Eye without leaving your car. 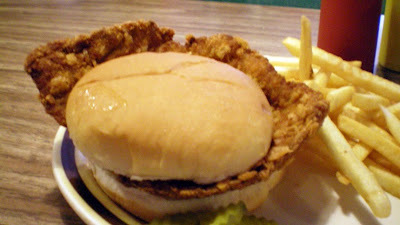 I never made it to Pat's Corner Cafe on Ingersoll before it closed, but people had recommended their Hot Beef Sandwich, and homemade chips to me back then. I may have to head back someday to try the one of the Cavatelli dishes. I just hope I can make it back before the operators of this place move on to open another restaurant.